The property will include 250 residences and a 263-room hotel with over 24,000 sq. ft of state-of-the-art function space including 11,000 sq. ft of flexible meeting and event space, 4,300 sq. ft of outdoor space and 9,100 sq. ft of public spaces. 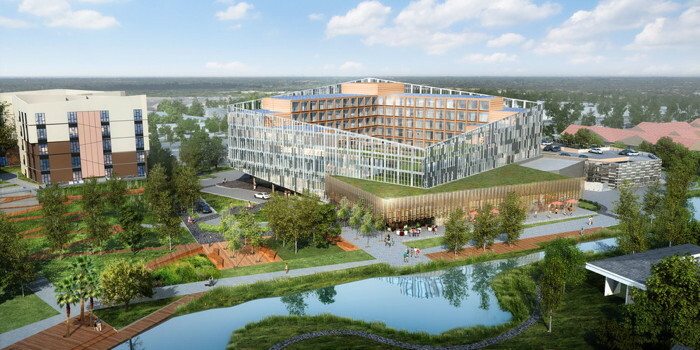 Millennium Hotels and Resorts today will hold a groundbreaking ceremony in Sunnyvale, CA on the site of the brand's newest hospitality and residential project, M Social in Sunnyvale, set to open in the first quarter of 2021. The construction of M Social in Sunnyvale, California marks the first property in North America and fourth globally to join the collection following Singapore, Auckland and Suzhou. Conceptualized as a trendsetter place by visionary founder Chairman Kwek Leng Beng, a Singaporean real estate and hospitality titan, M Social stands out as a lifestyle concept that embraces technology allowing people to socialize and interact with each other. The property will include 250 residences and a 263-room hotel with over 24,000 sq. ft of state-of-the-art function space including 11,000 sq. ft of flexible meeting and event space, 4,300 sq. ft of outdoor space and 9,100 sq. ft of public spaces. Among other technology features that will enhance the guest experience, the complex will feature 5G wireless capabilities, providing hotel guests and residents access to the fastest wireless technology available. 5G wireless technology allows for quicker downloads, the lowest latency and highest bandwidth to stream live TV, gaming and movies. Additionally, M Social will be the first steel frame modular hotel built in California. Modular construction allows for more efficient build times, reduced construction waste and less impact on the environment and on neighborhoods. The hotel will showcase a California-influenced stylish and vibrant design, and be positioned at the forefront of hospitality technology, enabling guests and residents to embrace the innovation and visionary mindset of those living and working in the area. "Today is a special day for Millennium Hotels and Resorts as the groundbreaking for M Social Sunnyvale marks the first new construction project for the brand in the U.S.," said Howard Wu, Global Chief Technology Officer and President of Millennium Hotels and Resorts North America. "The property's close proximity to Silicon Valley and 5G mobile technology services will further reinforce the M Social brand's commitment to technological advancements within its hotels." As Verizon is a leader in 5G wireless technology, Toby Redshaw – Senior Vice President, 5G Ecosystems, Innovation and Product Development for Verizon – participating in the ground-breaking ceremony on behalf of the Verizon team, commented, "Emerging technologies, and 5G in particular, can be revolutionary for the hospitality industry impacting hotel operations, guest experience and customer engagement. Today is just the beginning and we applaud Millennium Hotels and Resorts as we embark on this journey together." Are you with Millennium Hotels? If you are a member of Millennium Hotels you may be interested in learning how to optimize your content on our network.